When they were initially introduced, electronic health or medical records promised that they were designed with efficiency and quality in mind, yet they’ve instead come to present their own set of issues that have led many to question their role in healthcare and how it could be improved. Unlike paper health records, there aren’t as many guidelines that govern this data, as the American Health Information Management Association explained. “New guidelines are being sought by the healthcare industry that ensure and preserve documentation integrity in an age of electronic exchange and changes in the legal evidentiary requirements for electronic business and health records,” the association reported. In the meantime, data integrity persists as an ongoing issue for healthcare providers. What data integrity essentially means is that the data is accurate and hasn’t been wrongfully altered in any way. Inaccurate data has the potential to become major health risks for patients and a huge liability for providers, leading to such issues as fraud, abuse, data loss, incorrect or incomplete care. Why do we need data accuracy? Electronic health records have immense potential in the scope of healthcare. If used correctly, these tools can help patients receive better care from every provider they see and ensure that all pertinent medical information is being shared as needed. However, these advantages are simply not available without data accuracy. In addition to the numerous safety concerns, these errors are also associated with heightened costs for healthcare organizations. Electronic records are intended to address these problems, but as users already know, they have a number of their own critical issues to confront before they become an integral part of the solution. What problems specifically obstruct data integrity? A 2015 study published in Perspectives in Clinical Research explored the many ethical issues that complicate electronic health records, spanning from privacy and confidentiality to security breaches. In this study, Indian researchers touched on how data integrity suffers at the hands of widespread accuracy problems that can be so seemingly small yet make such a significant impact. The first such accuracy problem comes from certain actions and operations within these electronic systems, such as “cut and paste” or drop down menus. When clinicians improperly use the “cut and paste” function, it can lead to inaccuracies, which can cause serious health risks and liabilities. Drop down menus have a similar potential for error, as they limit the available choices to a clinician who may then make the wrong selection and input incorrect information. Error, loss or destruction of data can also occur during a data transfer, as the study noted. Similar errors were also explored by AHIMA, specifically noting problems with cloning, copying and pasting. AHIMA advised organizations to develop policies that explicitly address the improper use of these tools. Some common errors include vital signs that never change, information incorrectly copied and pasted from a different patient’s record and documentation from another provider including their attestation statement. AHIMA also brought up a problem where providers can use the same verbiage for all the patients they’ve seen within a specific timeframe without any significant changes, which can cause discrepancies between the patient’s case and what has been noted in the record. For instance, as AHIMA explained, this can include the use of incorrect pronouns like “he” instead of “she,” or a note that a certain problem isn’t present in the patient when, in fact, documentation shows a record of that exact problem. 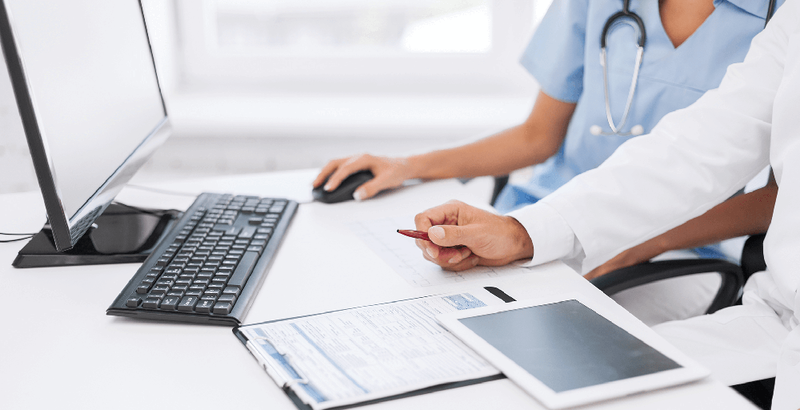 Providers can get in a habit of filling out the same electronic forms in the same way, and these critical errors could slip right past them. After combing through the many possible avenues for error, the question remains: how can the industry work to reverse this problem? What can be done to resolve these issues and preserve data integrity? As guidelines are proposed and worked through, there are plenty of ways that providers can implement certain tools and resources to make sure their data is accurate and serving them well. At Symphony, we are dedicated to providing healthcare organizations leading solutions and services that they need to give the best care through the accuracy of clinical and administrative data. Managing your EHR systems can be a significant challenge, especially when they present so many opportunities for error. With the right resources, you can make these systems the asset they’re meant to be, helping you reach your goals and produce the right outcomes. Jeff Barrett, RN is an accomplished healthcare IT leader with nearly 20 years experience in various clinical and technical roles, and with experience leveraging organizational data assets to improve quality, safety, and efficiency of health care delivery. Before joining Symphony, Jeffrey served as Director of Clinical Decision Support Technologies in the Clinical Innovations Department at Geisinger Health System, a nationally recognized leader in Healthcare IT utilization. During his tenure he grew the CDS team from three to nearly 30 clinicians, analysts, developers, and evaluators, and led the development of numerous HIT projects with significant impact in both clinical and organizational operations.